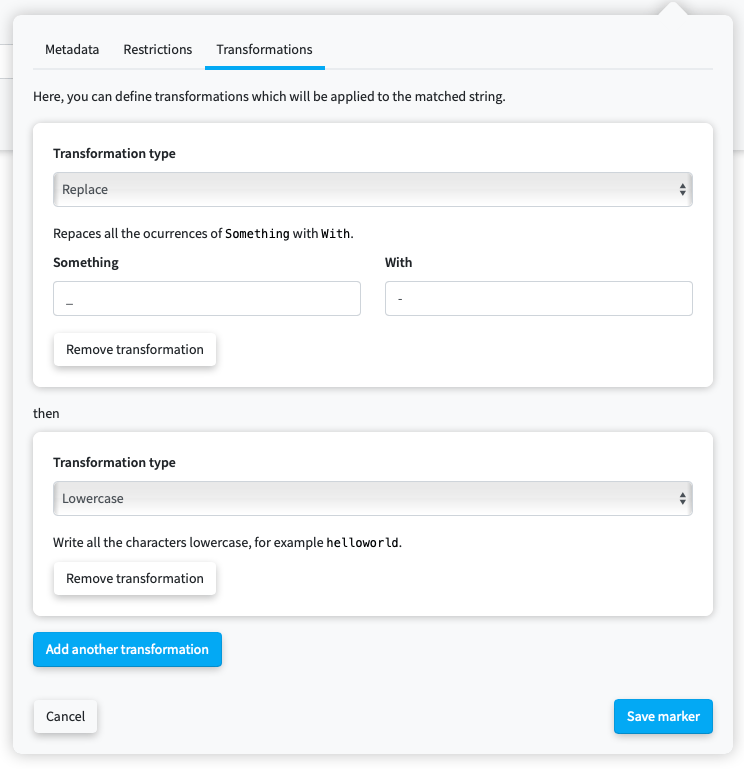 Triggers define the way redirection.io agents will match incoming requests before performing an action. Triggers are based on the incoming url, and can be defined as a simple url (for example /some/page.html) or a pattern (for example "match all URLs of the form /shop/products.php?id=<INTEGER>). Triggers are a powerful way to define several actions at once, based on patterns. For example, a redirection can be used to redirect all the urls of the form /shop/products.php?id=<INTEGER> to /shop/clothes/product-<INTEGER>.html, with the status code of your choice. Of course, the rules can embed much more complexity, based on the requirements you choose to apply on the markers. 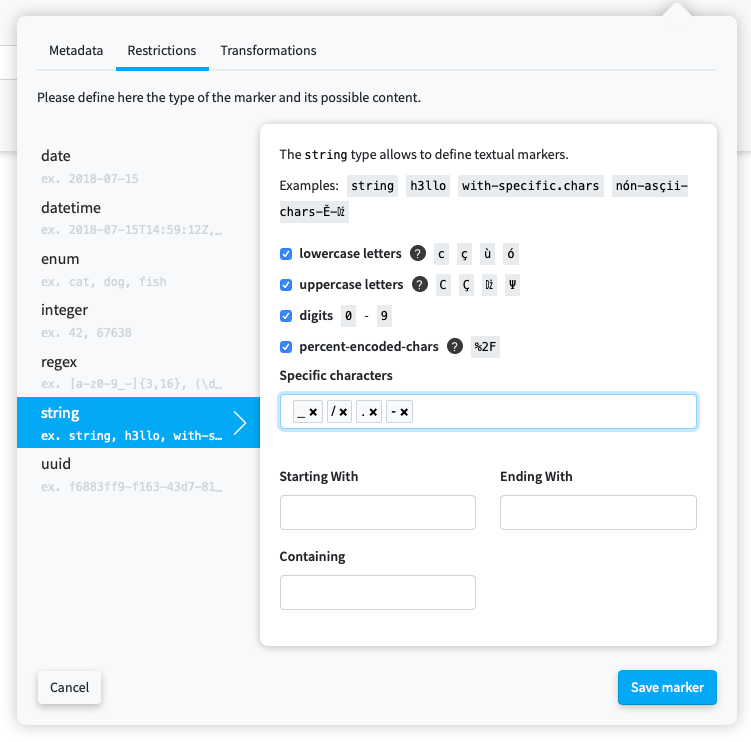 Under the hood, we use regular expressions to match incoming URLs, but you won't have to write manually these regular expressions. You can instead use our graphical expressions builder, which allows to express complex requirements in a simple way. click on the "Add marker" button. A modal window appears, with three tabs. The "Restrictions" tab allows to define the marker type and characteristics. You can for instance define string markers, containing only uppercase letters and starting with the FOO string. "Transformations" are an easy way to transform the matched values for reusing them later on, in actions. Once the marker is created, you can go on and use its value in the "Actions" part of the rule. 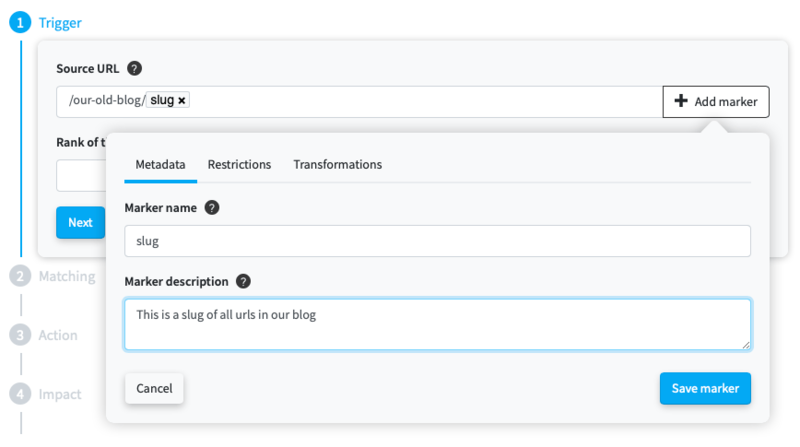 You can also simply use this marker to match a lot of incoming URLs, without using the marker's value (for instance, you could want to create a "Page not available" action for all the requests of the form /wp-admin/<WHATEVER>. The date type stands for a full-date, as per rfc3339. The datetime type stands for a date-time, as per rfc3339. The enum type allows to list exact accepted values. Values (required): Just type the character or word that the marker must match, and press "enter". The integer type matches positive integer values (aka. natural numbers). Minimum (optional): You may define a minimal value for the marker to match. For instance, if you type 404 in the "minimum" field, the values 405 and 1234 will be match, but not 88 nor 403. This bound is inclusive (which means, with the previous example, that 404 will be matched). Maximum (optional): You may define a maximal value for the marker to match. For instance, if you type 404 in the "maximum" field, the values 88 and 403 will match, but not 405 or 1234. This bound is inclusive (which means, with the previous example, that 404 will be matched). This type allows to define advanced matching expressions based on regular expressions. This is of course the most versatile way of creating markers, as it can help create very complex matching expressions. The string type allows to define textual markers, which is the most common case for defining markers. This type should cover most of the matching cases, this is the reason why it is auto-selected when you create a new marker. We support the full utf-8 range, which means that you can match regular ascii chars, but also emojis or specific alphabetical characters. lowercase letters (optional): Check this checkbox to match strings containing lowercase letters, as defined in the Unicode General Category Ll. percent-encoded-chars (optional): Check this checkbox to match strings containing percent encoded characters as per rfc3986. Specific characters (optional): You can add here several specific characters - it can for instance be the underscore char (_), a dash (-), a point (. ), etc. The uuid type matches valid uuid-formatted strings. The values that have been matched using markers can be reused in actions. For instance, if you defined a URL trigger with a marker named slug, you can choose to create a Redirection action to a url populated with this marker. <PRODUCT_ID> is an integer marker. Are you up to date on the subject of triggers and markers? Go on with creating an action.